Cured hog jowl, after one week of brining and three weeks of drying. Finally, some back-to-back success with curing meats, just as I’m feeling the need to go vegetarian more than ever. Fasting on a cleanse just isn’t going to happen. I love food too much. At least I’ll soon be trying to go bread-free for Passover. But for now, I’m still on pork. Just remember curing it doesn’t mean you eat much of it. 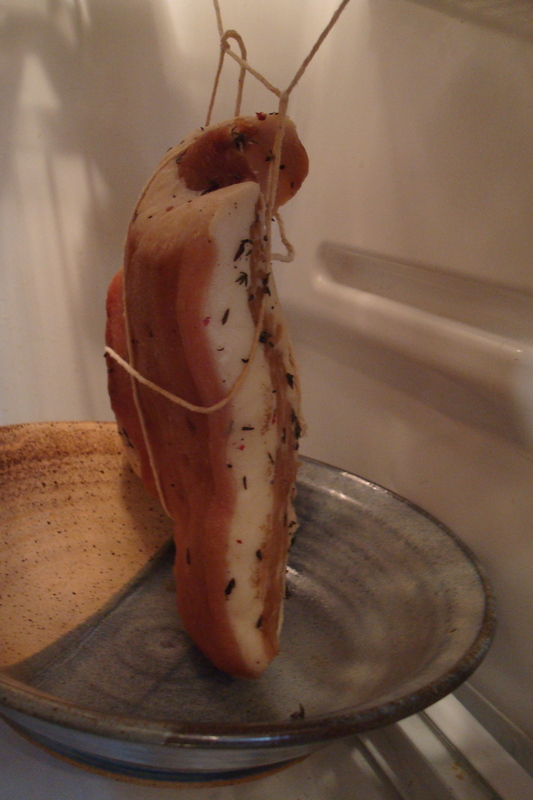 It’s still hanging in the fridge, a thin lardo-like, umami-rich slice to be rationed at a time. Still, it’s thrilling to see the guanciale turn out so well, after bacon and especially pancetta proved somewhat disappointing. And guanciale is more of an investment since it hangs to dry (in the fridge this time) for three weeks after the week-long salt, sugar and spice cure. Clear out space to hang it in the fridge: thankfully it didn't absorb those funky smells that the baking soda does. 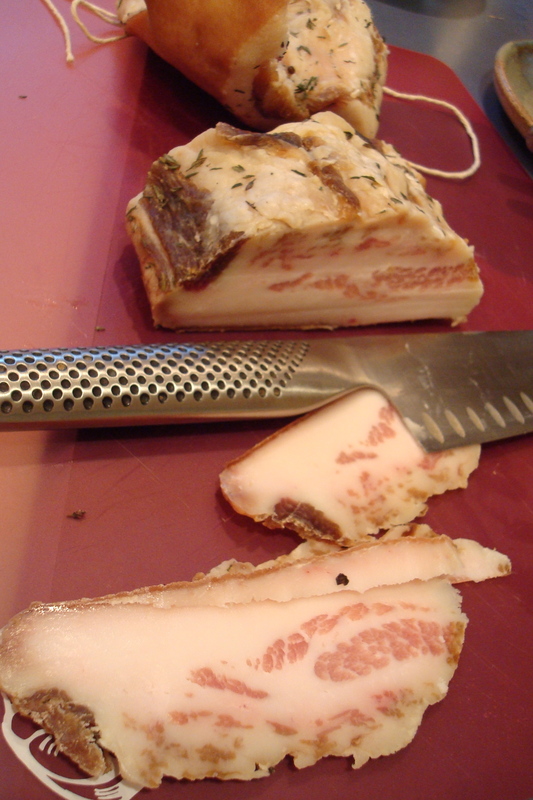 If you haven’t heard of guanciale, you’re not alone. I hadn’t heard of it either until making this Pasta All’ Amatriciana recipe (with bacon as a substitute) in Bon Appetit recently. 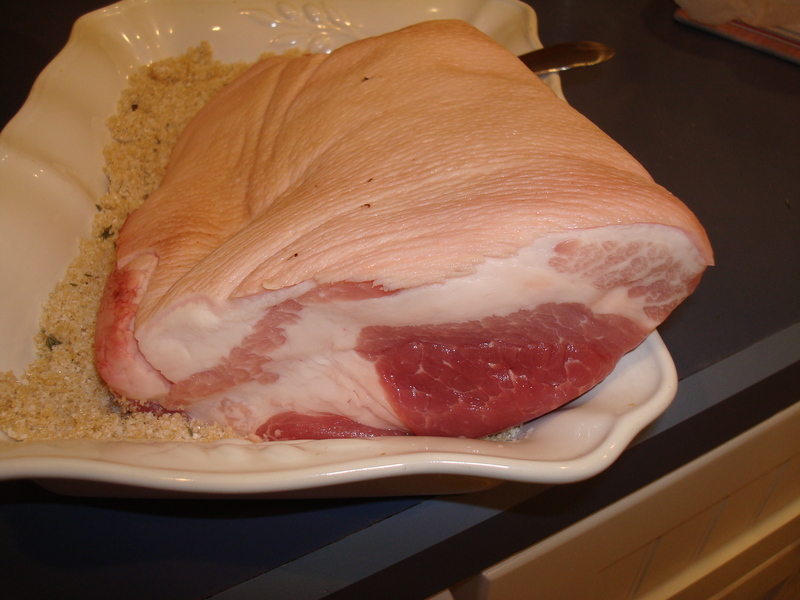 But unsmoked cured pork jowl just seems to have a more memorable quality that many cultures, including Southern, revere. So try some of your own. Sweet Briar Farms at our farmers’ market seemed delighted I wanted pig cheeks and jowl, those unloved cheap cuts no one ever requests. To make your own guanciale, Mario Batali seems to have the most recommended recipe. I’d like to try some more famous all’ amatriciana recipes with my finished product. Of course, I’d like to eat at Batali’s restaurants sometime, too. I’m sorry I didn’t get a chance to in Vegas last weekend.